Check out some of these interesting and far-out fun facts about dogs. 1. The Newfoundland has a water resistant coat and webbed feet. They were originally bred to help haul nets for fisherman and rescuing drowning people. How cool! 2. Did you know there was only three "dog survivors" from The Titanic?? 3. Rumor has it that The Beatles', Paul McCartney, recorded an ultrasonic whistle (only audible to dogs) at the end of one of his songs "A Day in the Life". That's how much he loved his Shetland Sheepdog! 4. Puppies have 28 teeth and normal adult dogs have 42! 5. Dogs do dream! It turns out they go through the same sleeping cycles that we do: slow wave sleep (SWS) and rapid eye movement (REM). 7. Why are dog noses so wet?! The answer is simple. Dogs secrete a thin layer of mucus that allows them to pick up smell better; they then lick their nose to sample the scent through their mouth. 8. Dogs have about 1,700 taste buds. Humans have approximately 9,000 and cats have around 473. 9. It's a myth that dogs can only see black and white. They actually view The World in more of a "faded" way... Check out the photo to our left! That's typically what life would look like, if you were a dog. they see primarily blue, greenish-yellow and various shades of yellow and gray. 10. Have you ever wondered why dogs kick after they go to the bathroom? They are using their scent glands in their paws to further mark "their territory". Now you know! I hope you learned some new fun-facts after reading this blog... Who would have thought that the reason dogs noses are wet- is to help with picking up smell; that one surprised me a bit. Sprinkles came into the Fort for her assessment this morning. 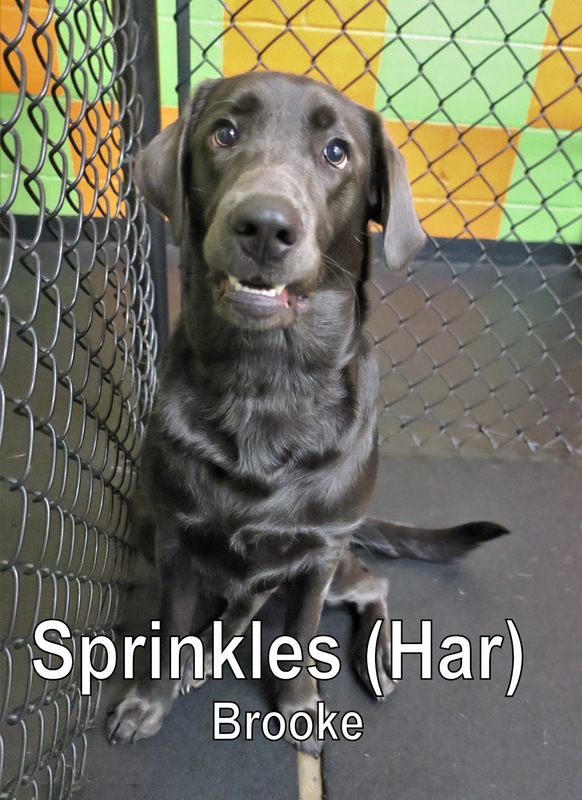 She is a nine-month-old, thirty-seven-pound, Charcoal Labrador Retriever. 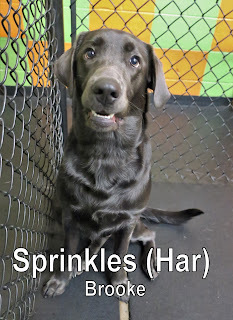 Sprinkles "spoke" very good dog, and enjoyed playing with all of her new friends in our Medium Dog Program. 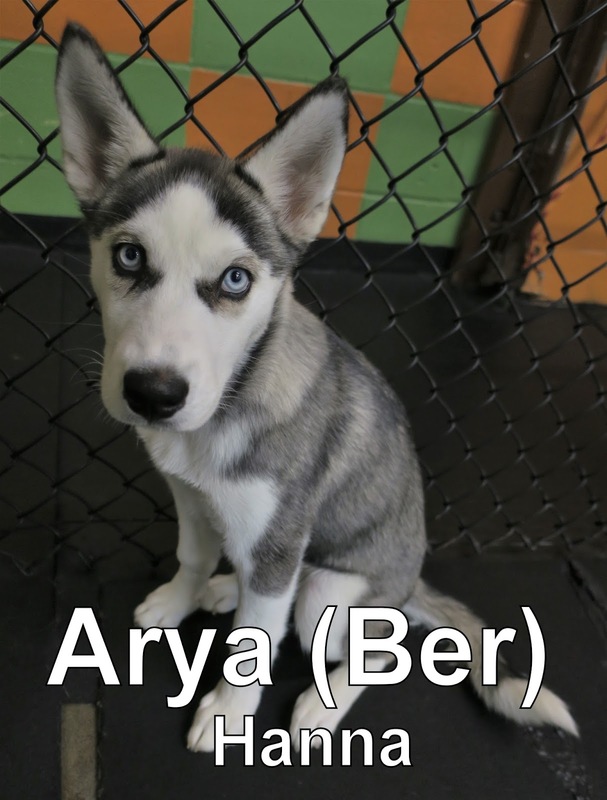 Her new best friend, Arya, is a three-month-old Husky puppy. The two of them played the entire morning. Sprinkles did a great job and is welcome back anytime. We look forward to seeing her again soon. Yesterday, we had the pleasure of meeting Kona. 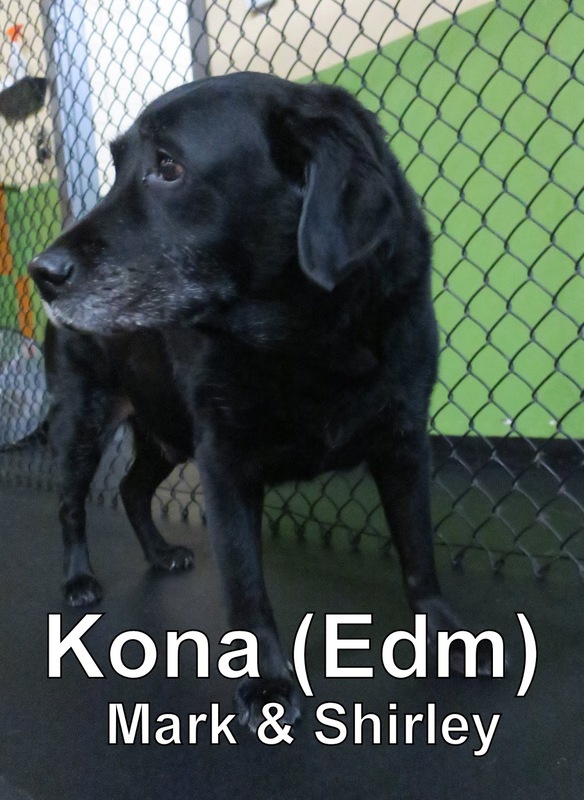 He is an eleven-year-old, ninety-pound, Black Labrador Retriever. He joined our Large Dog Program, where he spent the morning socializing with the other dogs. He had a good first day and we hope to see him again soon! Eventually Arya will join the bigger pups in our Large Dog Program- once her energy level rises, and she grows a bit. We've been getting a lot of rain lately. I was inspired to see if I could find some silly clips of dogs enjoying, and romping around in it... Watch the videos below, to see what I mean! 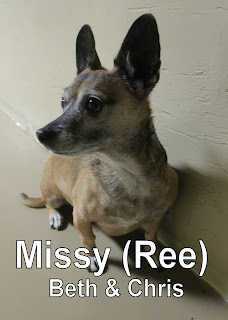 Yesterday, we had the pleasure of welcoming Missy to the Fort. She is an eight-year-old, fifteen-pound, Chihuahua/Dachshund mix. Missy is a very confident and well balanced little dog. She joined our Small Dog Program where she enjoyed mingling with the other dogs. Missy did a great job and is welcome back any time. We look forward to seeing her again soon! Friendly, fearless, alert and obedient are all great ways to describe this beautiful, silver breed. These dogs are not only great with kids, but they're the perfect dog to take on a run with you- because of their endurance... They're also very eager to please. These dogs were originally bred for hunting, in the early 19th century. Royalty used them to hunt large Game animals like Boar, Bear, and Deer. As Weimaraners popularity spiked, they were used for hunting smaller animals such as: Fowl, rabbits, and Foxes. These guys generally have bright Blue, or Emerald Green eyes. Their coats are very low maintenance- being soft, short, and smooth to the touch. Often referred to as "The Gray Ghost", because of their coat. Fort Fido Gift Cards: Available Now! In case you haven't seen, we officially have Fort Fido gift cards! These cards can not only be given as a gift- but have multiple uses; read this blog to find out how you can use our custom cards to benefit you! Are you having difficulties trying to figure out what to put in your significant other's stocking?! What better thing, than to surprise them with a custom Fort Fido card- with money already loaded on it... You can choose to put as much, or as little, as you want on there! This would be a great gift and stress reliever for busy parents, or people that are always on the go! All you have to do is come in and let us know you're interested in one! We'll load the desired amount of money you want on there, after you pay for it. The card keeps tract of how much money remains- after it's been used. You can load money on your individual card as many times as you want. Our Fido Cards have the potential to make payments faster and smoother for you, since all you have to do is keep tract of how much money is on there. They could also certainly aid in helping you stay more organized with your "doggie daycare budget". Whether you're getting the gift card for someone else, or yourself, don't hesitate to ask us any questions about them- if you have any. Pinecone was yesterday's dashing assessment. He's a six in a half year old, sixty two pound Brittany Spaniel that made a great addition to our Medium Dog Program. 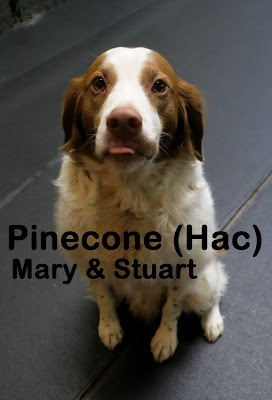 Pinecone had a grand time mingling with his new buddies, sniffing butts, wagging his tail, and showing great Dog Speak. It was apparent that he got more and more comfortable, as the morning progressed. We look forward to seeing him soon, when he comes back to board for a while! 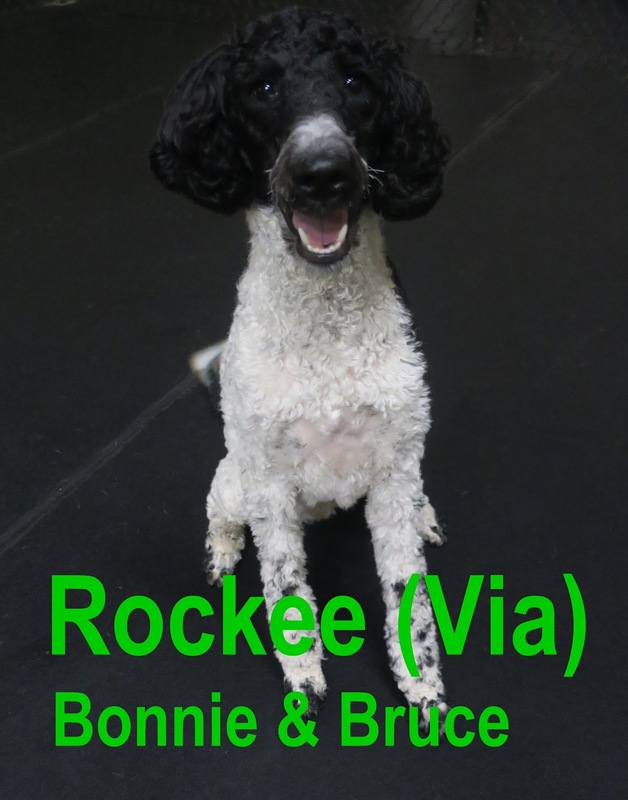 Rockee, was our lively assessment from today... He's a Standard Poodle who joined our Large Dog Program and weighs forty five pounds. When his owner picked him up, he explained how Rockee loves to go to off leash dog parks; that was certainly apparent here. No wonder he fit in so well. It's as if this ten month old has been coming here for years. We even captured him playing with his new poodle friend, Zola.